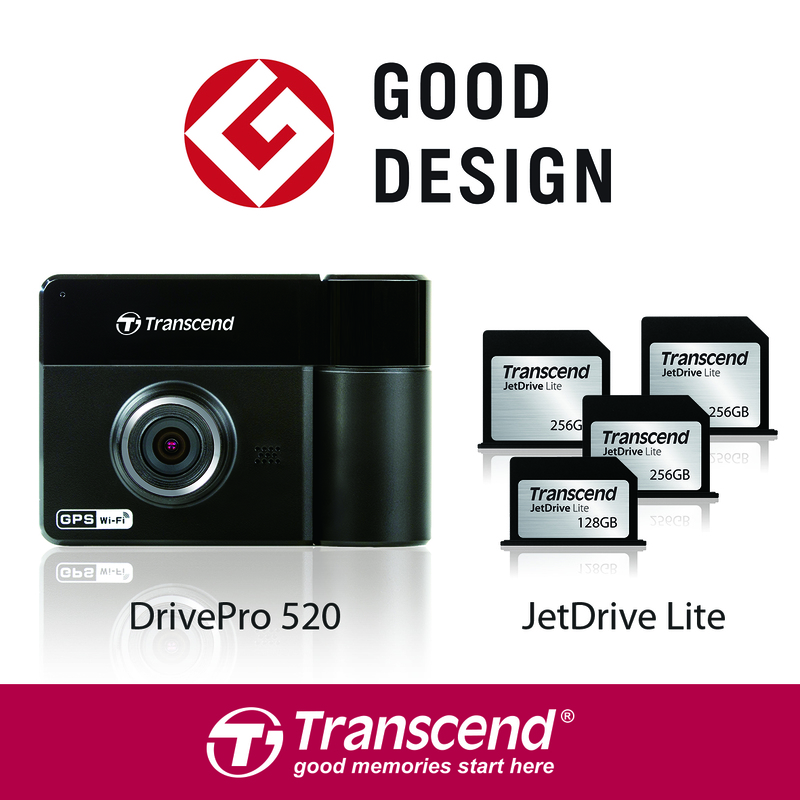 Transcend Information, Inc. (Transcend ), a leading manufacturer of storage and multimedia products, is proud to announce that its DrivePro 520 Dual Lens Car Video Recorder and the JetDrive Lite Expansion Cards have won the "Good Design Award 2015" for top design quality and groundbreaking design. The Good Design Award is one of the world's most prestigious design awards, with over 3,600 entries submitted from all over the world per year. For those who care about the road and personal safety, the DrivePro 520 is an ideal dual lens car video recorder that provides its drivers and passengers with optimum protection. Featuring a 130° viewing angle and a large f/1.8 aperture, the front lens captures crystal-clear Full HD 1080P videos with every detail happening on the road. The rotatable rear lens comes with infrared LEDs, allowing drivers to record sharp in-car videos at night or in low light conditions. The DrivePro 520 also comes with a built-in GPS receiver and Wi-Fi connectivity. Supported by the free downloadable DrivePro 520 App, the DrivePro 520 allows users to stream, download, and share videos on their smartphones and tablets. The jury for the Good Design Award commented, "As Uber-type transport services grow rapidly around the world, a car video recorder that can record both the exterior and interior of the vehicle is what drivers and passengers will need. The DrivePro 520 features a simple design; its functionality that allows users to access the camera from the smartphone app is a great idea that Japanese manufacturers can learn from." Transcend's JetDrive Lite (JDL) Expansion Cards are specially designed for MacBook Pro and MacBook Air users. With four different models offered in 64GB and 128GB capacities, the low-profile JetDrive Lite will not stick out like an SD card and can be left in place for on-the-go storage. According to the jury, the JetDrive Lite expansion cards are “truly tailor-made for MacBooks. Each card seamlessly integrates with a specific model of MacBook. The design is quite simple, yet good enough to attract consumer interest." With over 20 years of technical experience and expertise, Transcend has received many prestigious design awards, including Germany's iF and Red Dot awards, Japan's Good Design award and Taiwan's Innovation awards. The Good Design Selection System (or G Mark System) was founded in 1957 by the current Ministry of Economy, Trade and Industry in Japan. Submissions come from a wide range of fields, and roughly 1,200 designs are recognized every year. Over 59 years, around 42,000 designs have been recognized by the awards. Recipients of a Good Design Award are granted use of the G Mark symbol, which has been an emblem of good design for over half a century.